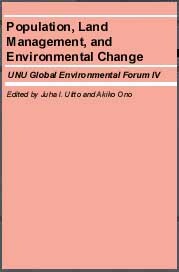 This publication is based on the UNU Global Environmental Forum, which brought together leading scholars from both the South and the North to address the issues of population, land management, and environmental change. The authors draw extensively upon field research carried out in the tropical and subtropical regions of South-East Asia, Sub-Saharan Africa, and the Amazon. Juha I. Uitto is with the Global Environment Facility (GEF) Secretariat in Washington, D.C. Akino Ono is Programme Officer at the Nagao Natural Environment Foundation, Tokyo.